Detailed Description: Ferraz Shawmut Ultrasafe™ Class CC 2-Pole Modular fuse holder with indicator provides excellent safety and is finger safe. It is made of durable polyamide material with insulation and accommodates pin-tie handles for easy assembly. It measures 1.380 Inch x 2.320 Inch x 3.170 Inch. Fuse holder has a voltage rating of 600 VAC/current rating of 30 Amps and is used with ATDR, ATMR, ATQR fuses to protect small inverters, motor drives, UPS systems. It features unique latching system for DIN rail mounting, to allow re-positioning. Fuse holder has compact footprint and allows for quick fuse change. Fuse holder is UL listed and CSA certified. Application All circuits (including branch-circuits) up to 600 volts (AC or DC) for motors, control circuits, transformers, etc. 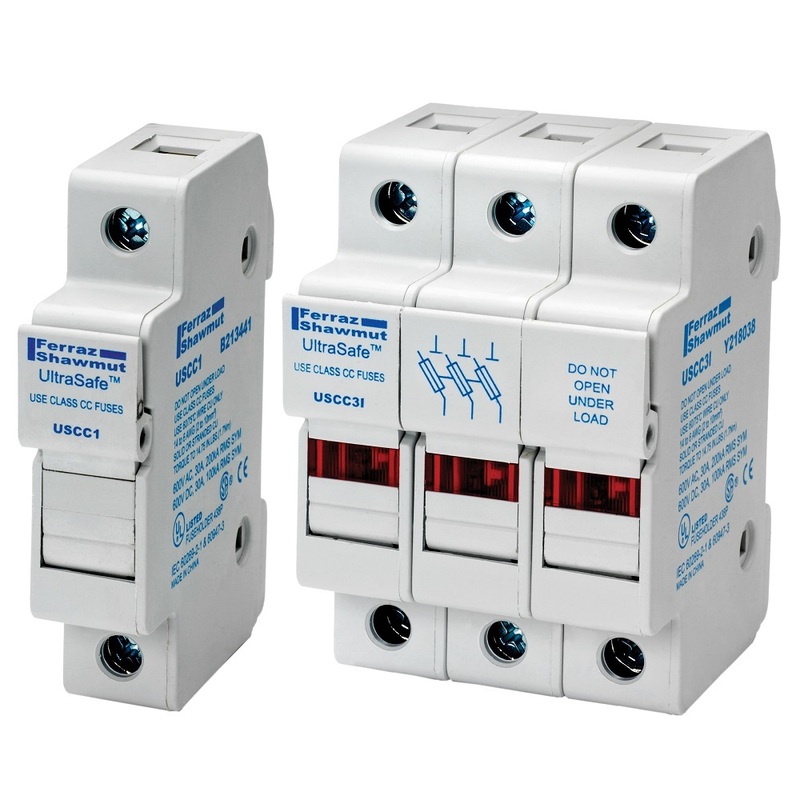 Catalog Description Mersen UltraSafe modular fuseholders introduce a new level of safety for class CC and midget fuses up to 30 amperes. UltraSafe fuseholders qualify as "finger safe" under IEC and DIN standards to an IP20 grade of protection, including fuse changing (with the flick of a finger). UltraSafe fuseholders are available in 1, 2, 3 or 4 poles, with or without visual blown-fuse indicators in each pole. Multiple poles can be assembled in the field by ordering and installing pin-tie handles. UltraSafe fuseholders save up to 15 percent mounting space and any combination can be snapped onto 35mm DIN rail for extra savings in panel building time. Choose class CC fuses for Type "2" no-damage protection, one of the safest protection packages in the industry. The UltraSafe body material is tough and durable polyamide, with exceptional insulating properties. 600 Volts 30 amps 2 poles standard indicator .